The new edition of this practical guide draws on the clinical skills of a wide range of international experts to help you recognize and manage heart disease in pregnancy. Designed for on-the-spot use, this convenient and concise text helps you identify a cardiac problem, understand its pathophysiology, and respond appropriately. The entire book is scrupulously updated to reflect the most current standards of care. The contributors – all recognized leaders in their respective fields – outline the pathway to diagnosis and appropriate management by a multi-disciplinary team. Although heart disease is the leading medical cause of maternal death, clinical trials in this population are few and the evidence base is small. 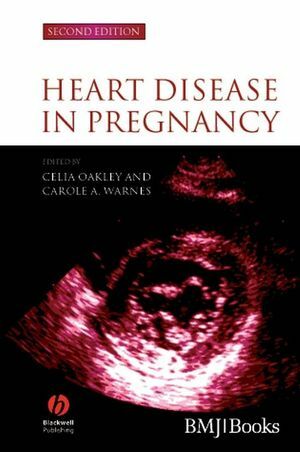 The expert recommendations in Heart Disease in Pregnancy, Second Edition, are a welcome source of information for cardiologists, obstetricians, general practitioners, and all members of the patient care team. 1. Overview: Celia Oakley (Hammersmith Hospital). 2. Physiological changes in pregnancy: Candice K Silversides (University of Toronto) and Jack M Colman (Mount Sinai Hospital and Toronto General Hospital/UHN). 3. Cardiovascular examination in pregnancy and the approach to diagnosis of cardiac disorder: Petros Nihoyannopoulos (Hammersmith Hospital). 4. Acyanotic congenital heart disease: Heidi M Connolly (Mayo Clinic College of Medicine) and Celia Oakley (Hammersmith Hospital). 5. Cyanotic congenital heart disease: Carole A Warnes (Mayo Clinic). 6. Pregnancy and pulmonary hypertension: Joseph G Parambil (Cleveland Clinic) and Michael D McGoon (Mayo Clinic College of Medicine). 7. Rheumatic heart disease: Bernard Iung (Bichat Hospital). 8. Mitral valve prolapse: Bernard Iung (Bichat Hospital). 9. Artificial heart valves: James R Trimm (Keck School of Medicine at University of Southern California), Lynne Hung (Keck School of Medicine at University of Southern California) and Shahbudin H Rahimtoola (Keck School of Medicine at University of Southern California). 10. Management of pregnancy in Marfan syndrome, Ehlers–Danlos syndrome and other heritable connective tissue disorders: Lilian J Meijboom (Onze Lieve Vrouwe Ziekenhus) and Barbara JM Mulder (Academic Medical Center Amsterdam). 11. Heart disease, pregnancy and systemic autoimmune diseases: Guillermo Ruiz-Irastorza (University of the Basque Country), Munther A Khamashta (St Thomas’ Hospital) and Graham RV Hughes (Imperial College School of Medicine). 12. Pulmonary disease and cor pulmonale: Claire L Shovlin (Hammersmith Hospital), Anita K Simonds (Royal Brompton Hospital) and JMB Hughes (Imperial College School of Medicine). 13. Hypertrophic cardiomyopathy and pregnancy: Jorge R Alegria (Mayo Graduate School of Medicine) and Rick A Nishimura (Mayo Clinic College of Medicine). 14. Peripartum cardiomyopathy, other heart muscle disorders and pericardial diseases: Celia Oakley (Hammersmith Hospital). 15. Coronary artery disease: Celia Oakley (Hammersmith Hospital). 16. Heart rhythm disorders: David Lefroy (Hammersmith Hospital) and Dawn Adamson (Hammersmith Hospital). 17. Pulmonary embolism: Celia Oakley (Hammersmith Hospital). 18. Hypertensive disorders of pregnancy: Alexander Heazell (University of Manchester) and Philip N Baker (University of Manchester). 19. Management of labour and delivery in the high-risk patient: Kirk D Ramin (University. 20. Anesthesia and the pregnant cardiac patient: Gurinder Vasdev (Mayo Clinic College of Medicine). 21. Cardiac percutaneous intervention and surgery during pregnancy: Patrizia Presbitero (Ospedale Humanitas), Giacomo Boccuzzi (Ospedale Humanitas) and Felice Bruno (Texas Technical University). 22. Genetic counselling: Michael A Patton. 23. Contraception for the cardiac patient: Philip J Steer (Chelsea and Westminster Hospital).